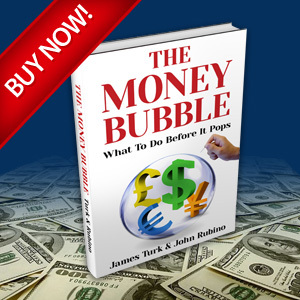 The dollar collapse thesis – which ends with all fiat currencies achieving their intrinsic value of zero — doesn’t preclude some thrills and chills along the way, in which some currencies fall faster than others and wreak havoc on various parts of the global economy. This may not look like much of a spike in the historical scheme of things, but it actually is, because a handful of developing countries have, for reasons that defy both history and common sense, decided to borrow trillions of US dollars. 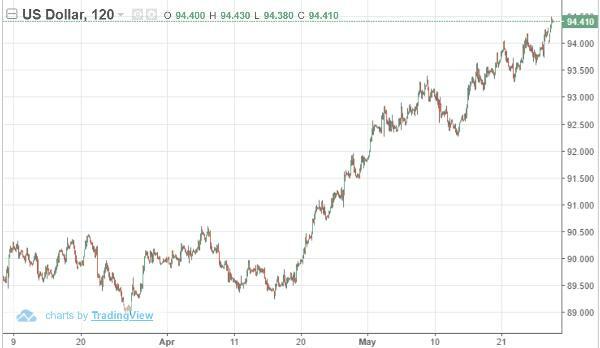 Now, with the dollar appreciating versus their local currencies, they’re having trouble making the suddenly-much-more-expensive interest payments. 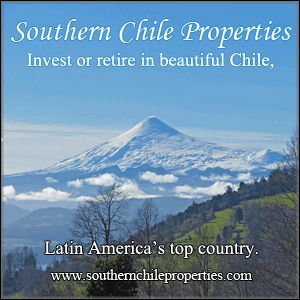 Why would a country whose money is the peso or the real conclude that it’s a good idea to bet that their currency will appreciate versus those of other countries for decades to come? Who knows? But they’ve done it, and big banks around the world have enabled them. 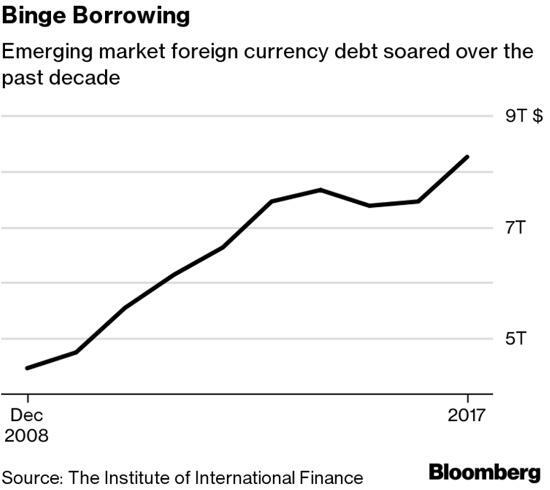 Here’s a chart from Bloomberg showing that the foreign currency debt of emerging market countries has nearly tripled since 2008, to more than $8 trillion (most of which is denominated in dollars, with some euros tossed in for diversification), which they now have to pay back regardless of where the dollar goes relative to the currency in which their governments collect taxes or their corporations make sales. 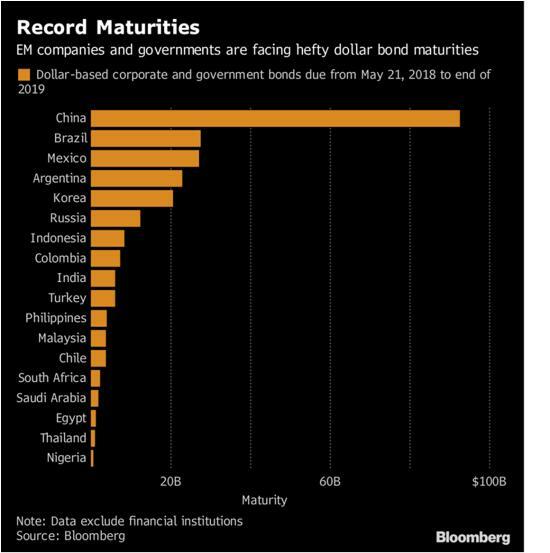 Emerging-market companies and governments straining to deal with the rising cost of borrowing in dollars face increasing pressure as a record slew of bonds come due. Some $249 billion needs to be repaid or refinanced through next year, according to data compiled by Bloomberg. That’s a legacy of a decade-long debt binge during which emerging markets more than doubled their borrowing in dollars, ignoring the many lessons of history from the 1980s Latin American debt crisis, the 1990s Asian financial crisis and the 2000s Argentine default. Even since the 2013 taper tantrum, the group’s dollar debt has climbed in excess of $1 trillion — more than the combined size of the Mexican and Thai economies, Institute of International Finance data show. 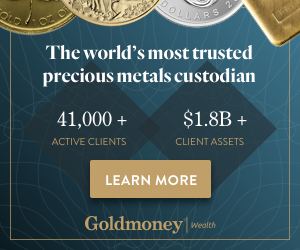 “We look to be in for a pretty rough patch near term,” says Sonja Gibbs, senior director for capital markets in Washington at the IIF, an association of the world’s biggest banks. “The sharper the rise in the dollar and rates, the greater the near-term contagion risk.” Rising U.S. rates will have a knock-on effect even in local debt markets, she said. China has far and away the most dollar debt coming due through next year among emerging markets. Though much of the debt is also owned by Chinese investors, strains have become clear in recent weeks, with some companies unable to issue at their preferred amounts and maturities, and others, unusually, marketing floating-rate notes. Despite having defaulted in the early 2000s, Argentina has issued so much dollar debt that it ranks No. 4 on the list — a testament in part to the impact that unprecedented U.S., European and Japanese monetary stimulus had in spurring a global hunt for yield since the 2007-09 financial crisis. Turkey has the largest foreign debt load relative to gross domestic product, and perhaps not coincidentally has one of the worst-performing currencies against the dollar this year, down about 21 percent. Only Argentina’s peso has done worse among 24 emerging nations tracked by Bloomberg — another country that ranks high on the debt metric. The rapid build-up in debt over the past decade has alarmed some — including Harvard economist Carmen Reinhart, who made headlines saying emerging markets are worse off today than during the 2008 crisis and 2013 taper tantrum. “This is not gloom-and-doom, but there are a lot of internal and external vulnerabilities now that were not there during the taper tantrum,” Gibbs said last week. Why should Americans care if Turkey or Argentina defaults on their bonds? Because institutions all over the world bought those bonds in more innocent times (see Here’s When Everyone Should Have Known That Argentina Would Implode), and have built share prices, pension payouts and arbitrage strategies around them. If the bonds blow up, so do a lot of banks, hedge funds and pension funds. And if the resulting global anxiety sends even more flight capital into the dollar – pushing its exchange rate up even further and making emerging market debts even harder to manage – we might be looking at a negative feedback loop with systemic implications.